Now that the dreary snow has finally melted away, it’s time to break out of our sheltered homes and enjoy the summer month. For many families, this means planning the big family vacation. Trips to amusement parks may be running a little stale, however, and as a result, your family may be trying to think of somewhere else they can go to connect with one another and create new and exciting memories. The world is vast and its activities even more variable. For those looking to do away with the standard vacation and instead have an adventure, here are a few ideas to discuss with your family! To kickstart your family holidays in 2018, why not learn a new skill? Surfing is not only excellent exercise that requires some strength and lots of balance, but it’s a bonding experience full of laughs and support. Regardless of your age, there is a surfing board and instructor for you. Learn how to ride the riptide or just fall gracefully. Either way, your family will be having a lot of fun. Since it’s a camp, you can rest assured that the training will be safe for the children and that you’re receiving expert advice on the sport. 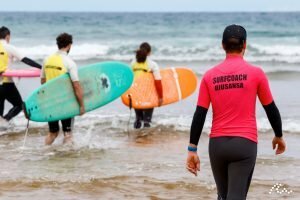 For those looking to indulge in a few adventure family holidays, a surf camp can be perfect for you. Sticking with water, perhaps your family can rent or purchase a couple of kayaks for a weekend. 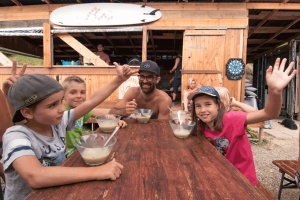 What makes this seemingly simple venture from other adventure family holidays is its unique ability to open up other adventures. Not sure exactly where you want to go for your family holidays in 2018? Choose a river or lake somewhere, load up the family, and just paddle at your leisure. You’ll never know where the current might take you. Pack away a lunch and stop off for a picnic somewhere you’ve never been before. Or, if you simply want the thrill of kayaking and your children are old enough, perhaps you may want to brave whitewater kayaking. Nothing quite promotes working together like battling rough waters. For those seeking a bit of culture to combine with their adventure, maybe you should consider kayaking in Europe. Stroll down the waterways of old rivers and discover ancient and historic buildings with your children. At the very least, you’ll all learn something by the end of the adventure. Another possible activity to consider for those family holidays in 2018 is zip-lining. For those who are unfamiliar with the venture, zip-lining is a popular recreation–some might even call it a ride–designed to quickly transport you from one area to the next via a cable that you slide along above the ground on with a harness. These are most popular in those areas with thick trees and plenty of wildlife to examine. Whether you wish to investigate a local forest or zoo or you want to take your adventure up to the next notch and actually visit a rainforest where these zip-line tours are available, then you won’t be disappointed. Soar through the trees and foliage as you’re exposed to breathless sights of greenery and gorgeous nature. You may even spot a few wild animals during your tour. The zip-line itself could be thrilling, especially for the children. Perhaps after some surfing, you may want to investigate under the water a bit further. This activity for adventure family holidays involves learning a bit about gear and the rules of interacting with ocean or sea life. Considering how rapidly the coral reefs are disappearing due to pollution and the environmental crisis, interacting and viewing the coral reefs in person may garner some appreciation for vital a role it plays in life on earth. This can be an important lesson to impart to your children. Whilst they delight in the brightly colored fish and almost alien-looking structures of coral, they’ll be learning important lessons about how everything on the planet is connected. Depending on where you scuba dive, you may even run into a family of dolphins who are having an adventure of their own! This is an adventure that can embody quite a few of these other adventures, especially if you’re looking to spend a few weeks for your adventure family holidays. At the heart of this adventure, though, is the experience of working together and testing your skills and ability to support as a family unit. Leave the RV and trailer at home and instead pack away a tent and necessary items for survival and comfort. Then hit the trail and–safely–navigate through the woods. By working together as a team to cross difficult paths or over small rivers, you’ll nurture the bond between everyone. After an exhausting and thrilling day of discovery and conquering nature, you can all gather around a campfire and bond over s’mores and memories of your own childhood. Without the distraction of phones, laptops, video games, and other electronics, you’ll be able to reconnect with your family under the open stars. Now, you might be thinking that this doesn’t seem quite like the adventure family holidays as mentioned before, but taking your family to an entirely new place is an adventure all its own. Not the block just around the corner, but somewhere new to you, too. Somewhere with a different culture, perhaps a different language, that requires you and your family to learn and adapt together. Not only can this have a huge impact on your children, but you may just walk away from the experience with a few lessons of your own, too. There is an assortment of adventure family holidays just waiting for you. Whether you want to hit the water and learn to surf or trek across the country, as long as you’re connecting to your family, an adventure will be had. So, jump out and make new memories.